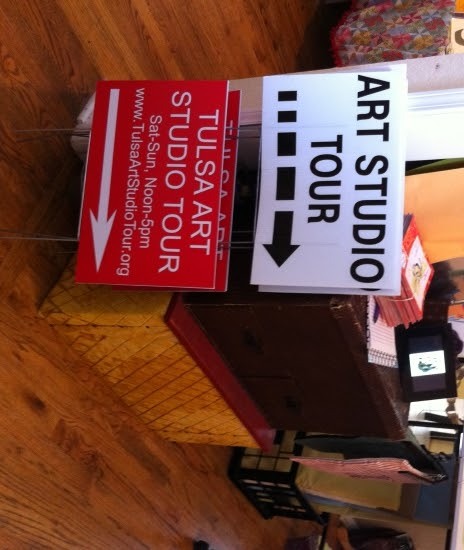 I wanted to share with everyone how lovely a time I had during the Tulsa Art Studio Tour. 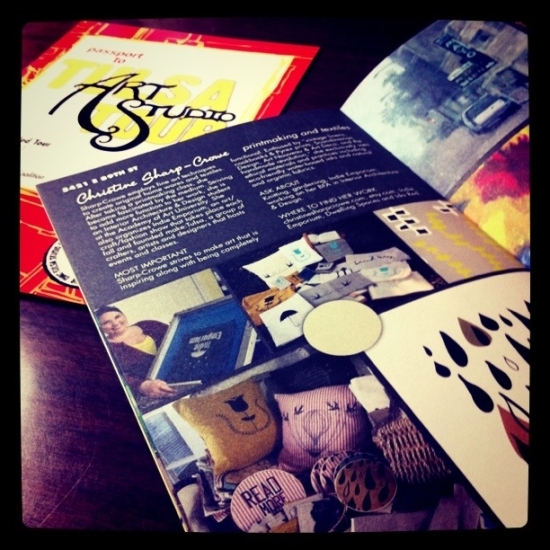 I met so many nice people and really enjoyed sharing my space and my process with them. For all of you lovelies that couldn’t attend, I took a bunch of pictures of my space before the tour and would love to give you a little walk through of my space. These were the passes/tickets for the event. My new cutting table, which by the way I *love*. The painting on the left is my very favorite piece of artwork that I own. 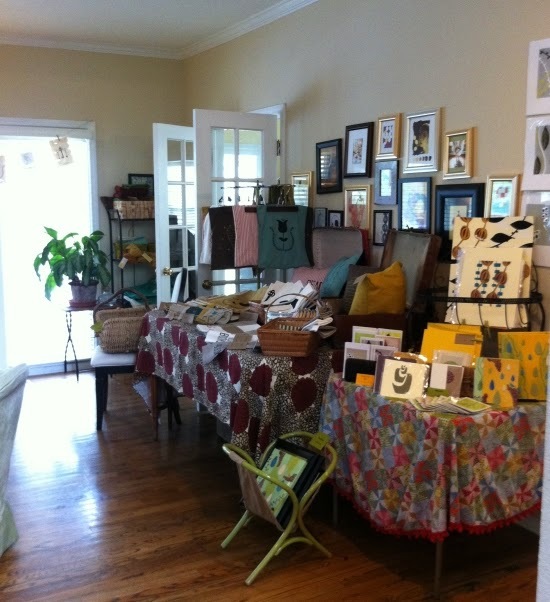 This is where I set up my finished product to sell. aka my living room. 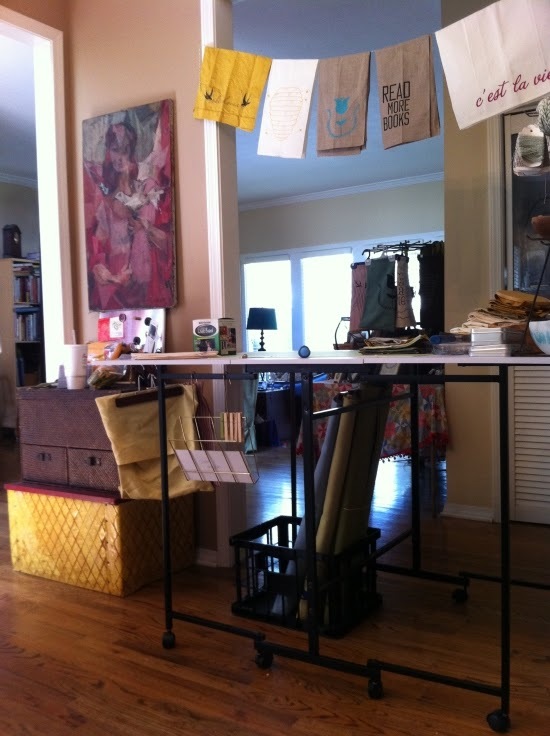 And my setup in the kitchen – because that’s where I really do most of my printing. 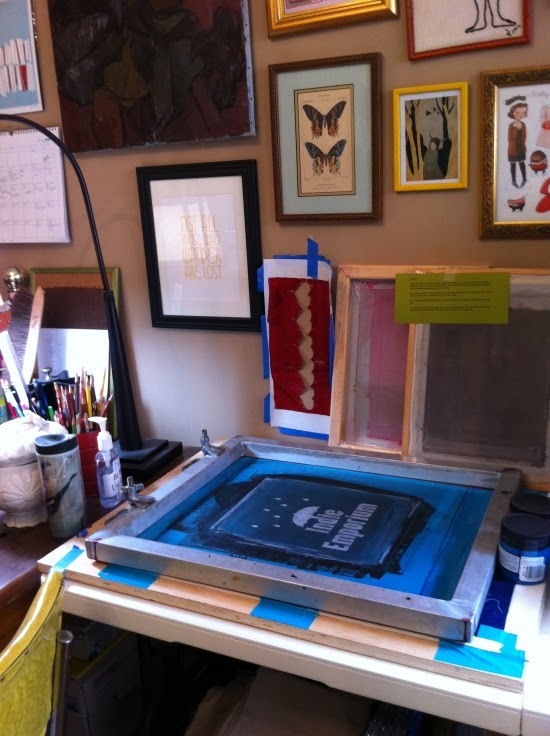 I hung examples of each step of my printing process so people could see how it all works.. 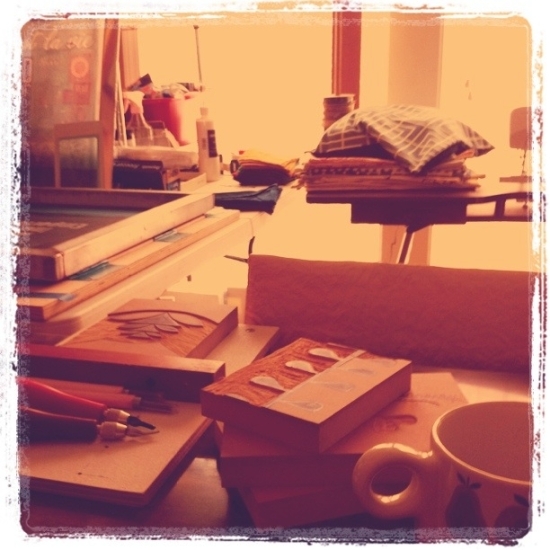 The printing area in my studio.. I do my test runs and color mixing here usually, but when I’m printing multiple things (like the 50 Oklahoma tea towels I’m printing today), I like to use the kitchen because of the higher counters and easier cleanup. Here’s the lino block I’ve been working on lately. And my big, lovely windows. 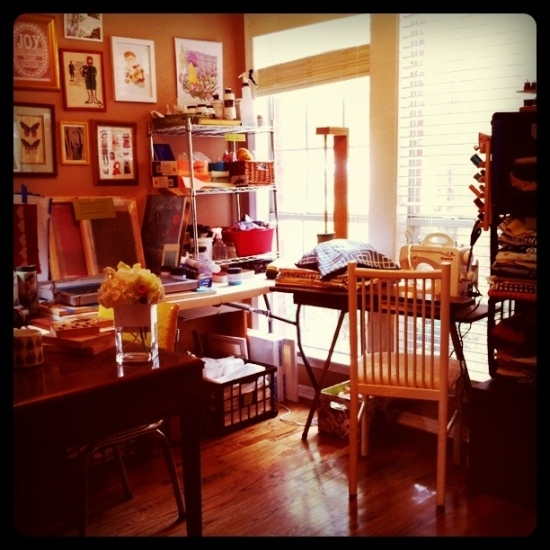 I love sewing here and watching the birds and squirrels outside. Next week I’ll share some photos from my other studio, the space I’ve been working in downtown. It’s been a little challenging having some things here and some there, but I’m so grateful to have the chance to have a little change of scenery. Even though I sure do love my space at home. 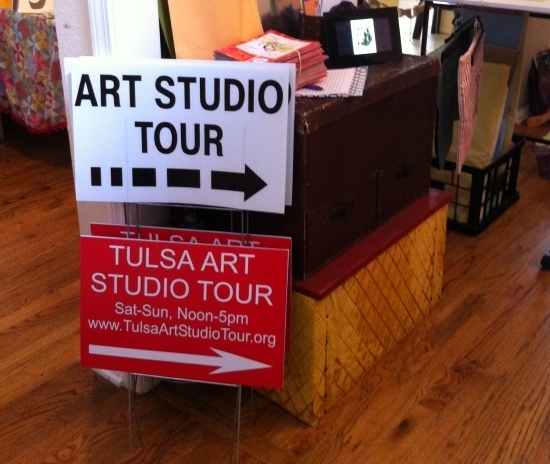 I’ll be packing up a few little bits of my studio this weekend to take downtown next week for a fun little opportunity that arose from being part of the Tulsa Art Studio Tour. 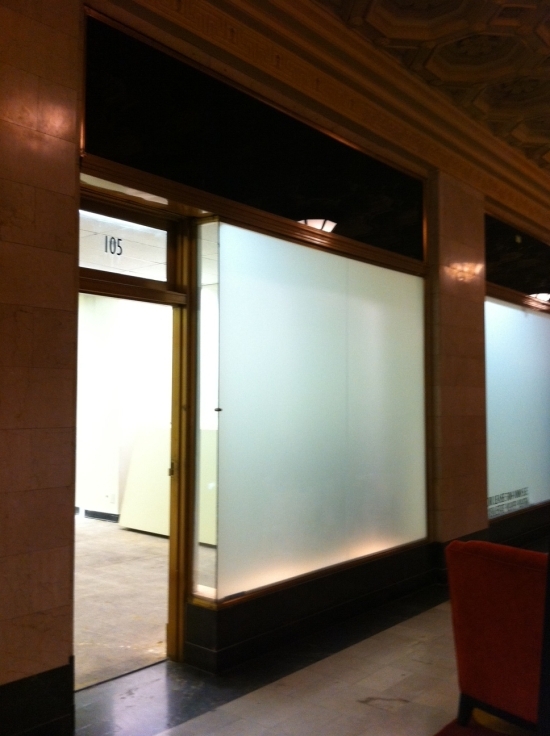 I’ll be temporarily working in a lovely little space in the lobby of the Atlas Life Building. 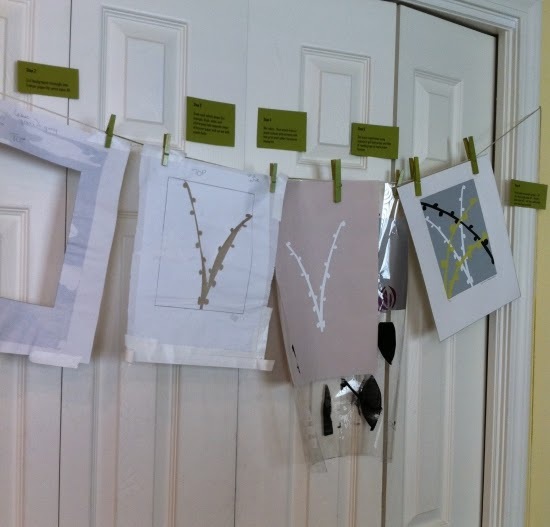 I don’t think I’ll be doing a lot of screen printing there, because the sink is pretty small and I’m sort of messy when I print, but I’ll be taking my sewing machine and some fabric that’s already printed so I can make lots of pillow covers for all of these busy Spring plans. I’m also going to take a few lino blocks and sketches that I’ve been itching to carve.. and maybe I can even do some lino printing while I’m there. I’ll be working there quite a bit over the next few weeks, so if you’re in the downtown area, come see me! I’m pretty excited to get out of the home studio for a bit because with all the chaos in my life right now, it’s been really hard to focus on my work.. There’s just too much laundry, too many phone calls, and other things to catch up on. I think getting out of the house for a few weeks will force me to focus on my work and maybe be a little distraction from some of the other worries. oh, the other worries. The husband got his staples out (all 50 of them!) yesterday. His incision was 11.5 inches – goodness, but he’s healing nicely. It’s a cold, I’d even venture to say blustery, Thursday in Tulsa. I spent the day drinking coffee and working in my studio. 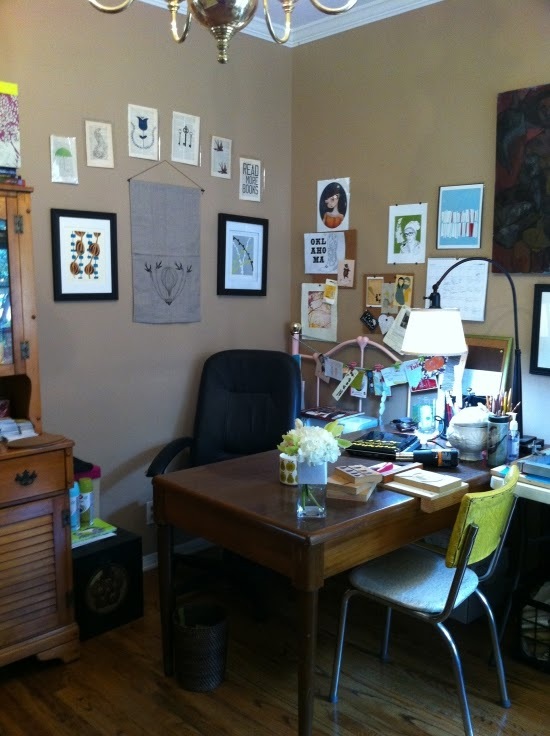 I have so much art/craft/drafting/design stuff that it’s hard to fit it in one room and still have space to work. I’ve tried to compartmentalize all of it into sections in the room, but that only goes so far. So, after spending some time looking around the room and reflecting on what was necessary in my space and what could go, I chose to move all of my inventory into our never used theater/game room. That was yesterday and I was pretty unsure about how the husband would take it, but when I broke the news this morning he was on board with my setting up all of my inventory, even in store format, in our upstairs game room. SO, that freed up my studio closet where I can now keep some of my less frequently used supplies and my shipping boxes. And, I’m finally going through those 10 boxes that have moved from house to house (5 times in 4 years!). I think there are 3 left. Overall, a productive, but uneventful day. I leave you with a Thursday Polyvore. I’m off to spend the rest of the evening sketching some painting ideas that have been floating around for a while. I’ll post some studio photos tomorrow, the batteries are charging!